About Isn't this website enough? Odawara is a town of about 200,000 inhabitants located in the region of Kanagawa, about 70 km south of Tokyo, near the much more famous Hakone. This is not a very touristy town, and actually there is almost nothing to visit. The only reason for which Odawara can worth a visit is that it has the only japanese-style castle located in the vicinity of Tokyo (I mean the only one which can be visited by a day trip from the Japanese capital). 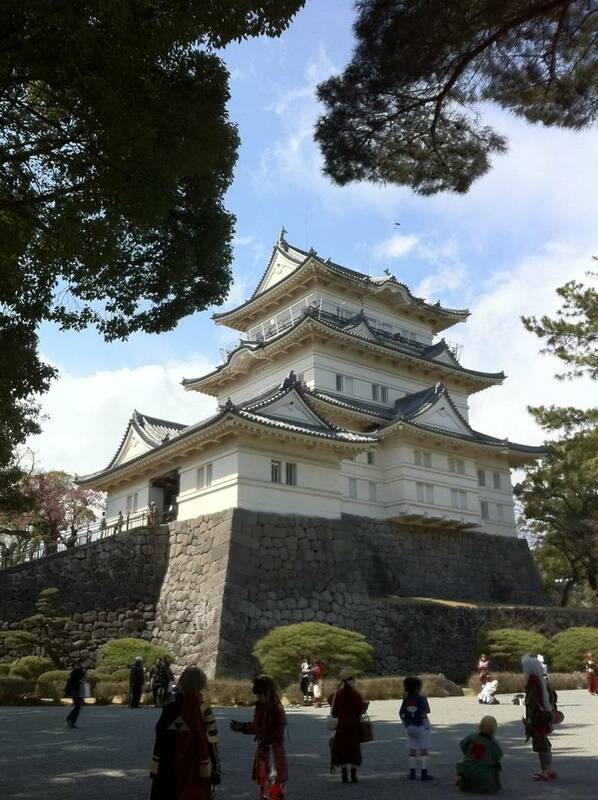 If the destination of your trip is just Tokyo and you want really want to see a Japanese castle, you can only go to Odawara. This castle was founded in 1447, and after passing over the centuries under the control of different clans, it was for a large part demolished during the Meiji period (end '800). The structure that you can see today is a reconstruction built mainly in the 1960s. The castle is surrounded by a beautiful park which can be visited for free, the admission ticket is required just for the building of the castle. Inside, there are various exhibitions of objects and weapons of the past, while from the top floor you can enjoy a view of the surrounding area with the sea in the background. Since Odawara is located on the sea, its most popular delicacies of Odawara are fish based. Other famous coulinary delights are kamaboko, ika no shiokara and the famous umeboshi, special salted plums prepared with the many plum trees grown in the surrounding countryside. The park surrounding the castle is located about 600 meters far from the East Exit of Odawara station. Tokyo is connected to Odawara station by two railway companies, Odakyu Railways and JR. The cheapest option is the Odawara line of the private company Odakyu Railways, which connects Tokyo's Shinjuku station to Odawara station (95 minutes, 850 YEN). JR connects Tokyo to Odawara by two different lines, the Tokaido Main Line from Tokyo station, Shinbashi, Shinagawa, Yokohama station, etc (about 90 minutes, 1450 YEN) and the Shonan-Shinjuku line from Ikebukuro, Shinjuku, Shibuya, Yokohama station, etc (about 90 minutes, 1450 YEN). Some high-speed trains (shinkansen) between Tokyo and Osaka also stop at Odawara station, but just that ones called Kodama (35 minutes, 3640 YEN). I advise you to take into consideration JR lines only if you have a Japan Rail Pass e quindi potete viaggiare gratis, if you must buy the ticket the Odakyu line is definitely more convenient. Odawara is located very close to the popular tourist destination of Hakone, the two towns are connected through the Hakone Tozan line (15 minuts, 300 YEN). If you are planning a trip to Japan and you want to do something more than just visiting famous places and monuments, we suggest you to use Govoyagin. Govoyagin is a very useful website to enrich your travel experience, especially if you are going solo or it's your first time in Japan. Because of the language barrier (and more), in Japan it is very difficult to interact with the locals and to get off the tourist track. Thanks to Govoyagin you can find a lot of interesting and sometimes unique guided tours and activities all over Japan (and not only in Japan), that you would otherwise never be able to enjoy. But there's more: on Govoyagin you can also buy tickets for several famous attractions, events, transportation and other useful services for tourists. Last but not least, you can reserve a table in hundreds of restaurants.